For many New Yorkers and New Jersey residents who had shared a view of the skyline of Manhattan prior to September 11, 2001, a strange thing happened to all of them that day. Two towering buildings that were emblazoned in their brain's picture of the skyline were instantly erased. Every year at dusk on the anniversary of the September 11 terror attacks that took the buildings and the lives of many Americans, you can see the ghostly illumination in the night sky of two towers of light. The Tribute in Light is an art installation that was produced by the Municipal Art Society of New York that serves as an annual memorial to never forget the tragic events of that fateful day. Since 2012, they have been presented by the 9/11 Memorial Museum. 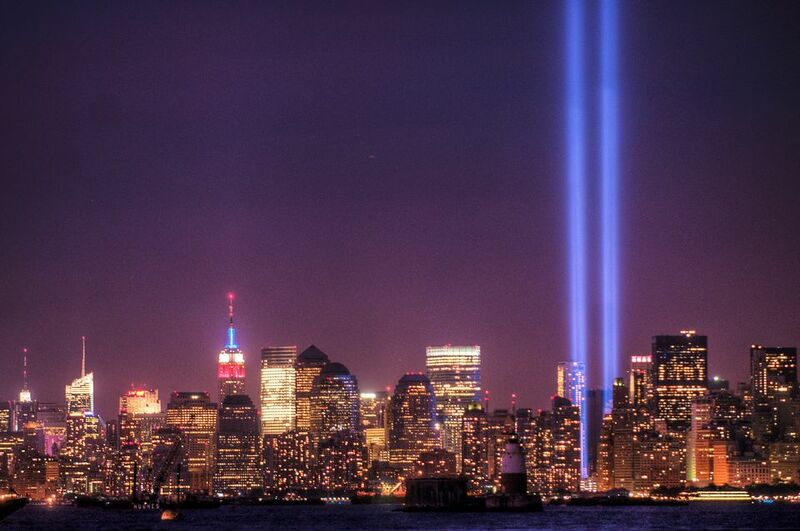 The Tribute in Light is usually illuminated from dusk on September 11 until dawn on September 12. It is also often illuminated in the evenings before each anniversary for short periods of time for testing, so if you are in town the few days before the anniversary, keep an eye out for it. The Tribute in Light is best viewed from the waterfront outside of Manhattan, including Jersey City, the Brooklyn Bridge Promenade, and Gantry Plaza State Park, though the Tribute in Light can be seen from many places in and around New York City. On a clear night, it can be visible for more than 60 miles away, as far north as Rockland County, which is about an hour's drive from New York City, as far east as Fire Island in Suffolk County, New York, on Long Island, and as far south as Trenton, New Jersey. The two beams of light were first lit at 6:55 p.m. on March 11, 2002, on the six-month anniversary of the attacks on a lot next to Ground Zero. The memorial was first turned on by Valerie Webb, a 12-year-old girl who lost her father, a Port Authority police officer, in the attacks. Mayor Michael Bloomberg of New York City and Governor George Pataki of New York State were with Webb when she flipped the switch. The two towers of light are composed of two banks of high wattage spotlights—44 for each bank, which creates each beam of light. The lights point straight up. Each 7,000-watt xenon light bulb is set up in two 48-foot squares, mirroring the shape and orientation of the Twin Towers. Each year the memorial is set up on the roof of the Battery Parking Garage near the World Trade Center. Since 2008, the generators that power the Tribute in Light are fueled with biodiesel made from used cooking oil collected from local restaurants. Several different artists and designers independently came up with a similar idea and they were then brought together by the Municipal Art Society and Creative Time, a New York-based non-profit arts organization. The Tribute in Light was designed by John Bennett, Gustavo Bonevardi, Richard Nash Gould, Julian Laverdiere, Paul Myoda, and lighting designer Paul Marantz. Want to Attend the Westminster Kennel Club Annual Dog Show in NYC?